The TMP1700/470 is the lowest cost PINSTAMP® marking system. 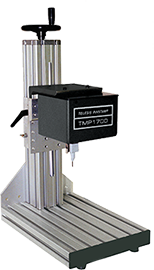 The rugged TMP1700 marking head features a compact, 1-1/2˝ x 2-1/2˝ (38.1mm x 63.5mm) window, and marking speeds up to six characters-per-second. It’s an excellent choice for many factory-automated or on-line processes.